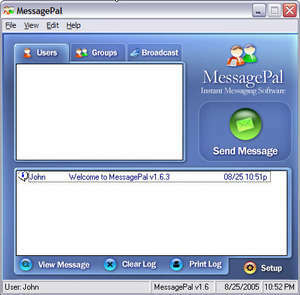 MessagePal provides simple, secure, instant messaging between users on your LAN. Only two minutes to download and install, MessagePal is a peer-to-peer system requiring no central server or administration. MessagePal provides simple, secure, instant messaging between users on your LAN. MessagePal 1.8.0 is a shareware program and can be used as a demo to try the software until the free trial period has ended. A full version of the program is available after the trial period ends. For security reasons, you should also check out the MessagePal download at LO4D.com which includes virus and malware tests. Additional screenshots of this application download may be available, too.